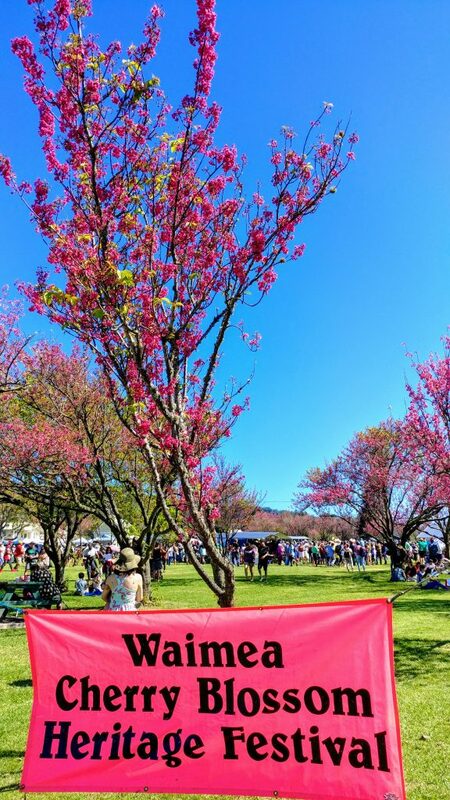 Celebrating a quarter of a century, the Waimea Cherry Blossom Heritage Festival is scheduled for Saturday, Feb. 3, 2018, from 9 a.m. to 3 p.m. The 2018 event will mark festival’s silver anniversary, which showcases the blooming of Church Row Park’s historic cherry trees and the Japanese tradition of viewing them—hanami. Hanami celebrates the fleeting beauty of nature while heralding the arrival of spring. Always held on the first Saturday of February, the festival is often back-dropped by a wintery white summit atop Maunakea while Church Row Park is festooned in pink blossoms. The family festival originated in 1994 under the direction of former county Parks and Recreation Director George Yoshida. Festivities includes a wide variety of activities at multiple venues throughout Waimea. Look for pink banners identifying site locations throughout town, sprawling from Church Row Park to the Parker Ranch Historic Homes. Spend the day to experience an all-day lineup of Japanese and multi-cultural performing arts at several locations, plus hands-on demonstrations of bonsai, origami, traditional tea ceremony, fun mochi pounding, plus a host of colorful craft fairs, a quilt show and food booths. Roberts Hawaii will provide free shuttle transportation among most venues, though walking is encouraged. The Waimea Cherry Blossom Heritage Festival is produced by the Hawai‘i County Parks and Recreation’s Culture and Education Section. Overseen by Parks and Recreation Director Roxcie Waltjen, the festival is a community-wide effort by a dedicated team of volunteers. For more information, call (808) 961-8706. Feature image photo credit: Crystal Richard.